Prototype: 3 type Habbiillnss high-capacity sliding wall boxcars. Privately owned cars of the firm Wascosa, leased to the Swiss Post, Inc. All three cars have different advertising designs. The cars look as they did in 2016. Model: This is a new car type with a fine prototypical paint scheme and lettering. The car floors for all of the cars are constructed of metal. The models are individually packaged. Total length 276 mm / 10-7/8". 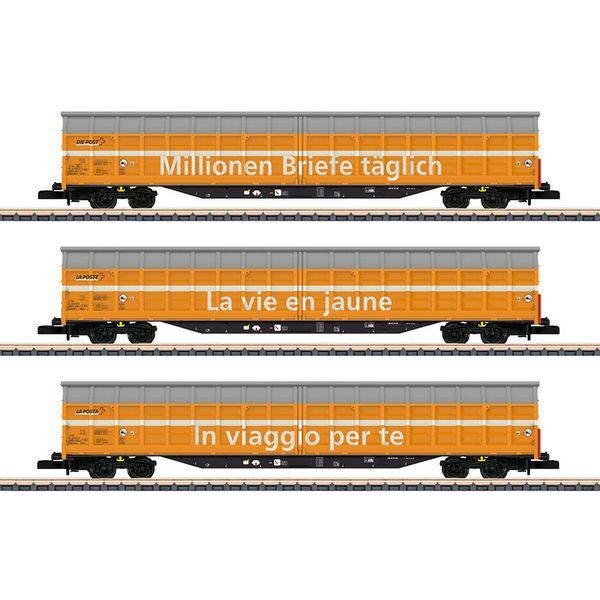 The Swiss family firm WASCOSA has the business model of leasing special freight cars. Among the over 7,000 units of the extensive car pool are the innovative type Habbiillnss sliding wall boxcars for the transport of weather-sensitive, high capacity, palletized freight. With a load surface of 62.4 square meters / 671.66 square feet, a maximum cargo load of 63.5 metric tons, two or more sliding and locking separation walls and a maximum speed of 120 km/h / 75 mph they are setting new standards for functionality and logistics.